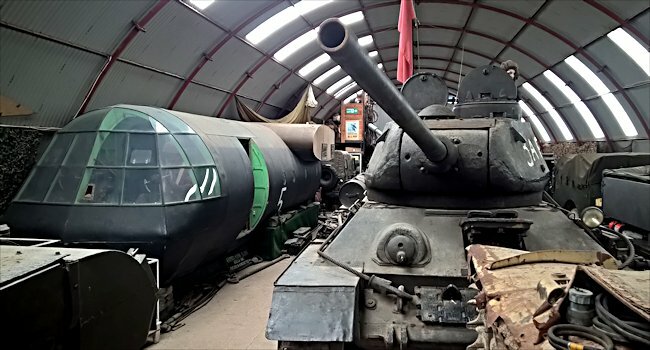 T-34/85 Russian Soviet WW2 Medium Tank at the Cobbaton Combat Collection next to a D-Day glider. The T-34/76 Soviet tank entered production in June 1940. Its successor the T-34/85 tank was first built in 1943 and the production ended in 1964. The total amount of tanks produced is estimated at around 50,000. The suspension was based on a pre-WW2 American J Walter Christie design that was rejected by the American military in the 1930s: their loss. The armoured sides and front glacis plate were sloped to deflect incoming shells and increase the amount of armour a shell would have to penetrate without an increase in weight. It was powered by a diesel 38.8 litre 500ho V12 engine that gave economy of 1.5 mpg when most other tanks gave only 1/2 mpg. It managed to have a top road speed of 40km/h. Driving was hard work as all the controls seemed to require a lot of hard physical effort. It seemed like the Russian ideal of a T34/85 tank driver was some one who was 4 feet tall with very long arms and the strength of an ox. 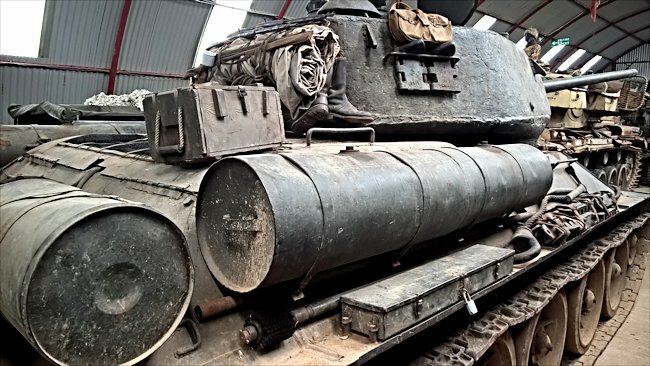 The tank at Cobbaton Combat Collection was imported from the Czech Army Reserve in 1989 by David Freeman of DEF Armaments. Preston Isaac of Cobbaton Combat Collection brought the tank. Apart from the ammunition the only thing missing was a small tin of radio spare parts. This tank was fully operational. It was a Russian built tank but the Czechs rebuilt it in 1970/71 for a contract with the Egyptian Army which was later cancelled. It had been placed in storage ever since that date until it was imported into the UK. The T-34/85 Soviet tank is more like an American Tank Destroyer than a proper tank. This may seem like an outrageous statement to make as it was one of the most successful armoured combat vehicles in the later part of WW2 on the Eastern front. A tank is a fighting system. The idea of that is you can engage other tanks in anti-tank warfare, using your gun and the crew can operate efficiently doing that. In most tanks that will mean the fighting crew in the turret have something to stand on, so that as the turret rotates the crew can move with the turret and operate the gun effectively. The T-34/85 is a single compartment, with an engine at the back and the crew are standing all in one position just like in an Allied Hellcat or Wolverine tank destroyer. It was designed to be produced cheaply and in large numbers. The gunner only had access to 9 rounds immediately. To get more they had to be fetched from compartments under mats in the floor and elsewhere. It is not an optimised designed vehicle for fighting tank on tank warfare. It looks like a tank but it did not work as well as other tanks on the battlefield. People say the T-34 was the first modern tank with good sloped armour, yes but it is not really designed inside to be fought like a modern tank. It was not an efficient fighting machine compare with other tank designs of the period, but Soviet Army Marshal Georgy Zhukov said 'Quantity has a quality all of its own.' If you have enough bad tanks you can gang up on better tanks and fire at weak spots. To hell with the casualty figures. There are always more T-34/85 tanks coming off the production line. 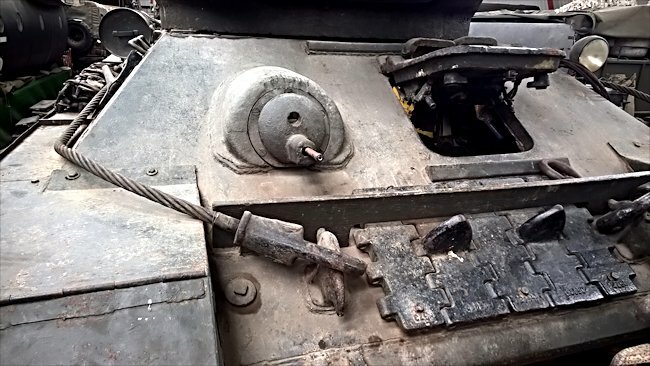 One of the revolutionary features of the cheap T-34 tank design was the track pins. The length of long thin metal, like a nail or rivet, was knocked through the eyes of two separate tank track links to join them together. On most other tanks the pins are secured into position by clips or a nut and bolt system. 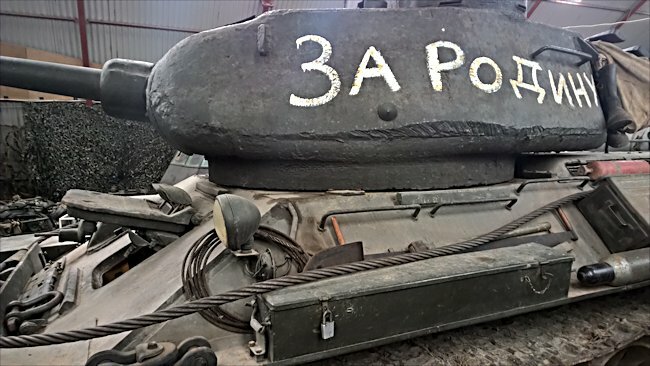 On the T-34 tank they are loose. At the back of the tank there is a lump of metal that juts out of the body near the top of the track. As the track goes past it any loose track pin is knocked back into position. A cheap and effective way of keeping them in the correct position. Unlike German and Allied tanks Russian tanks did not have speedometers. Around 105 parts were needed to be manufactured to make a speedometer. Why go to that expense in a war situation. It is a tank. Who cares how fast it is going. The driver is not going to get a speeding ticket. The tanks cannot go very fast anyway. Some were later fitted with a dial that told the driver if it was in revers of forward gear. The T-34 tank was based on an agricultural driving system. There were many stories during the war of T-34 tanks on fire having been hit charging and ramming German tanks and troops. That was not quite true. In the very early versions of the tank it was like driving a tractor. When you start the engine you put your foot on the accelerator. In order to move forward you had to take you foot off which seemed unintuitive. The reasons there are accounts of T-34 tanks on fire and the driver appearing to be trying to ram the enemy is that the driver was dead and his foot was not on the pedal. On later model T-34 tanks this driving system was changed to a more modern system. The T-34/85 had a lot bigger turret than the T-34/76. Rather than having one large hatch in the turret two smaller hatches were installed. They were circular but only had one hinge rather than being cut in half and having two hinges; again a cost issue. The problem was that when the hatch was opened by the commander it increased the height profile of the tank and made it easier to be spotted.